Some tea in Shizuoka, especially Higashiyama area, is cultivated by the traditional “chagusa-ba” method, which is often translated as traditional tea-grass integrated system. The dried-grasses mainly bamboo and pampas called “chagusa” are cut down, dried, shredded and spread around the roots of tea trees as a mulch. Eventually it will be a good compost. It seems that “chagusa” prevents weeds from growing along the furrows, enriches the soil, helps retain moisture and fertilizer for a long period, and helps new leaves grow better. Naturally, the tea taste gets better and the flavor improves. This method is not only for making good tea. It is good for biodiversity. Since the grasses are cut down regularly, other fauna and flora including rare and endangered species survive in that area. (This method is designated as GIAHS 'Globally Important Agricultural Heritage System'). * You will learn about Chagusa-ba method "The secret to High Quality Tea by UNU Channel"
One of the farmers who grow tea with this method is Kaneroku-Matsumotoen tea farm. Their family started tea business about 200 years ago and have been keeping the method since then. 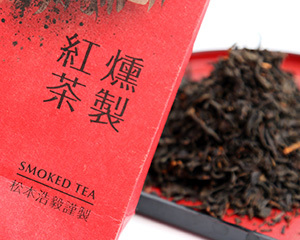 While keeping its tradition method and tea, they produce ’innovative’ tea like the first Japanese smoked-tea. 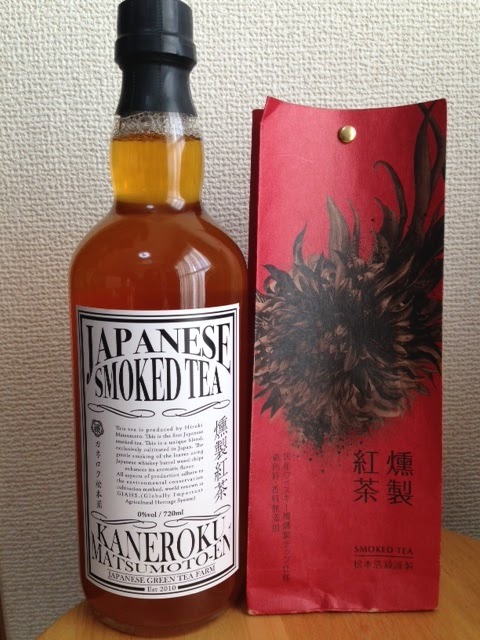 Their signature is the Whisky-barreled smoked tea leave….and its bottled tea too! I think Matsumoto's tea is made from harmony of human and nature, and tradition and innovation.